It's official: Michelle Obama is the first lady of American fashion, appearing on the cover of the March issue of Vogue. Every first lady since Lou Hoover - save Bess Truman - has been featured in the high-fashion magazine, but Mrs. Obama is only the second to grace the cover. She appears wearing a magenta silk sheath dress by Jason Wu, who also designed her inaugural gown. Vogue's editor at large Andre Leon Talley called his interview with Mrs. Obama ahead of President Barack Obama's swearing-in ceremony "one of the best experiences of my life." "She's so accessible, natural and normal. There's nothing affected about her," he said. Much of the eight-page feature inside is devoted to Mrs. Obama's self-described role as "mom in chief" to 10-year-old Malia and 7-year-old Sasha. "I'm going to try to take them to school every morning, as much as I can," she said. "But there's also a measure of independence. And obviously there will be times I won't be able to drop them off at all. I like to be a presence in my kids' school. I want to know the teachers; I want to know the other parents." Being Vogue, though, the conversation eventually turns to clothes. Mrs. Obama said she is aware of how her wardrobe is being scrutinized, but she makes no apologies for her choices - even the Election Night combination of ripped-from-the-runway, fashion-forward dress and plain-Jane cardigan. "I'm not going to pretend that I don't care about it," she said. "But I also have to be very practical. In the end, someone will always not like what you wear - people just have different tastes." She did choose outfits for the Vogue photos by labels she has worn before: Wu, who made her inaugural gown; Narcisco Rodriguez, the designer of that Election Night dress; and J. Crew, which she and her children have famously worn. 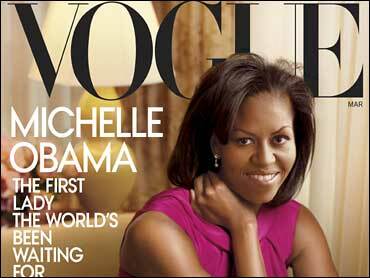 Most cover models have their clothes chosen for them by Vogue, or at least editors work as advisers. Not this time. "She doesn't need any help. She loves fashion and knows what works for her," Talley said. "She's never had a conversation with me about, `What do you think?' or `How did this look?' And I'm glad for that."